NieR: Automata is the latest external series to collaborate with Final Fantasy Brave Exvius, Square Enix revealed today. 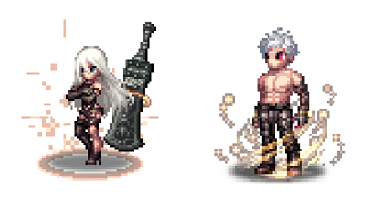 Beginning August 11 through August 24, characters such as 2B, 9S, 210 and Adam will be featured in the game as obtainable units. During this limited time event, players will face off against waves of machines and familiar NieR: Automata bosses as they collect medals to exchange for special in-game rewards and materials use to craft weapons and armor – including Emil’s Head. Additionally, from August 9 through 18, players can purchase a special summer package once per day for 400 Lapis. This limited bundle contains numerous in-game items for around 50% off and includes a Rare Summon Ticket, Magic Key, NRG (stamina) and more. Posted in Final Fantasy Brave Exvius, NieR. Choo choo, it’s the cash-grab train!! No mention of A2 or is she a special summon? i’m happy that the event date is finally confirmed!! i’ve been saving the whole time so that i can get the chance to grab 2B. however…. it’s ’21O’ as in the letter ‘O’, not the number ‘0’…. it’s a small gripe, but it’d bother me if no one said anything. Brave Exvius stopped being a Final Fantasy game when Ariana was added. Why everyone complains about the AG event? Dangerous Ariana was a good black mage back then and the event itself was interesting and because of it a lot of people got the game downloaded. I stopped playing shortly after AG showed up. Final Fantasy is supposed to have Final Fantasy characters in it, not celebrities. Not really, because with that logic the events of Brave Frontier, Nier:Automata, Dragon Quest Monsters: Super Light, Monster Hunter Explore, etc… shouldn’t have been created (and that would be tragic). Don’t let something you don’t like bother your experience with a good game, just my opinion.